Over the past few years I've experimented with various types of atomizer and tank setups, but clearomizers are definitely my go-to choice for all day vaping. They hold plenty of liquid to last throughout the day, they're cheap and easy to replace, and they perform extremely well when given the appropriate care. Two of the most common "clearos" are the Vision CE4 / CE5 and Kranger EVOD tanks. I've had plenty of time to play with both, so here is some feedback on these widely used clearomizer setups. For those of you who aren't familiar with vaping technology, there are several different options for holding e-liquid and creating vapor. A cartomizer, or "carto", is the most common setup and is included on most mini / cigalike products. A carto is typically made up of a solid cylinder filled with polyfill material, where the polyfill delivers e-liquid to an internal heating element. 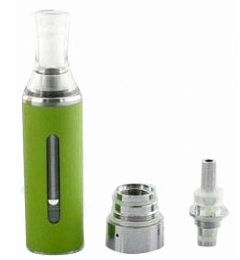 On the other side of the spectrum is a clearomizer, or "clearo" tank. As the name implies, a clearo is typically made up of a clear plastic (or glass) tank that uses wicks, rather than filler material, to deliver e-liquid to the heating element. There are other options, and there are pros and cons to both of these setups, but I prefer clearomizers since they're easier to refill, clean and maintain. The most common clearo included with most eGo-type setups is the Vision CE4 clearomizer, a disposable unit that's cheap and easy to replace. It's big brother is the CE5, a rebuildable version with a replaceable wick, head and coil, but otherwise virtually the same. My first eGo setup included a CE4 and I was definitely impressed with it's simplicity and solid performance. Unlike a carto, it held a decent amount of e-liquid (1.6ml) and I could visually monitor the level so I knew when it was time to add more juice. 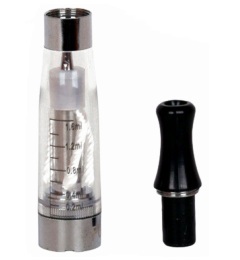 CE4 clearomizers feature a "top coil" design where the wicks are situated towards the mouthpiece of the tank. They're quite long and extend all the way to the bottom, so as your liquid level drops they tend to dry out and it's a good idea to tip the unit sideways on occasion to keep them submerged and completely moist. Although some people prefer bottom coils, since the wick is constantly submerged at the bottom of the tank, I find that the top coils provide a hotter and thicker vapor. To me, it's not a big hassle to tip my e-cig sideways every once in a while to keep the wicks wet, and I've never had a major problem with burnt or dried wicks. Overall, the performance of CE4 clearomizers are not bad. They provide nice, thick clouds of vapor, are super easy to refill (just remove the mouthpiece to top off) and they only cost around $5 each. The CE5 performs just as well, except you keep the tank section and only replace the removable head and coil (around $2). The only major complaint I have with the CE4 is the removable mouth piece. There have been numerous occasions where the threads have stripped and I couldn't tighten it down completely, causing it to leak from the top. Other times the threaded collar came loose, causing the same problem. It's also not wise to take a drag with the unit tipped upward, another situation that causes leakage, and sure to cause the unit to "gurgle" until you clear the excess liquid out of the coil. A few quick draws should stop the gurgling, but be sure to wipe off any leakage, because it sure doesn't taste good in your mouth! A relative new kid on the block compared to Vision's CE4, Kranger EVOD clearomizers are extremely popular because of their excellent performance and bottom coil design. Like the CE4, the EVOD is compatible with any eGo-style battery and holds up to 1.6ml of e-liquid. The EVOD has a built-in mouthpiece, unlike the CE4, and must be refilled from the bottom. It's just as easy to top off, although it needs to be removed from the battery and liquid tends to drip into the tip - nothing a quick wipe won't fix. The EVOD is only slightly more expensive than a CE4 (about $7) and it's completely rebuildable. Like the CE4's sibling the CE5, replacement coil units are easy to install and only cost about $2 each. Purchase in bulk and they cost even less, a great way to reduce vaping expenses. Performance-wise, many people prefer bottom coil clearomizers because they have less wicking issues, but personally I've found that the EVOD produces too "airy" of a draw. Luckily, you can use a bit of tape to cover one of the tiny air holes in the base, if you'd like a tighten things up. Vapor-wise, it performs well, but it's noticeably cooler which seems to reduce the "throat hit". An increase in voltage can remedy this, but only with a VV device. The only other minor complaint I have, is that it's slightly harder to see your e-liquid level. On a bright sunny day it's easy to peek inside the small view window, but in the evening or a poorly lit space, it's almost impossible to see how much e-liquid you have left. The big advantage, to me, is that there's virtually NO LEAKAGE with EVOD clearomizers. Because the tip is fixed, there's no way for it to seep out around the mouthpiece. I get less "gurgling" from too much e-liquid entering the coil, and I almost never have nasty e-liquid leech into my mouth or on my tongue. Both setups have pros and cons. I love the EVOD for it's smooth performance, low maintenance and lack of leakage, but I sometimes I feel like it falls short in the throat hit department. Used with a variable voltage setup, more voltage should improve this quality (and you can increase the PG of your e-juice), but used with a standard 3.6V eGo and the same PG/VG blend, a CE4 tends to produce slightly more satisfying hits. Of course, leaking e-liquid is pretty damn annoying, especially when it gets into your mouth and completely numbs your tongue. Besides the leaking, CE4 clearomizers are also much less reliable - with more frequent cleaning required, regular "gurgling" and other performance issues. I still have a few CE4s, but for now I've got my voltage turned up and I'm sticking with my EVOD - one air hole covered to tighten the draw. UPDATE: I recently purchased my first "dual-coil" EVOD clearomizer - huge improvement over the single coil! The vapor is warmer and much more satisfying. No need to cover air holes on this bad boy! The EVOD is now the clear winner! Having used the ce4 and ce5 for a while I recently stumbled on the evod2 in my local vape shop. With the dual coils you have a fantastic vape with no leakage and I prefer the airflow of the evod 2 vs the ce4/5. This is a great explanation of the two systems and I personally would never buy another ce4/5 cart. Hopefully people will find this as I think many more people would stop smoking if they new that you can get a great value vape all day long with no gurgling or leaking liquid.